November 10, 2015 By heather Leave a Comment This post may contain affiliate links. Read my disclosure policy. Enjoy the slight sweetness and crunch of these sweet potato fritters with honey cinnamon butter. The countdown for Thanksgiving continues. Just found out we have some family coming into town to stay with us for the holiday and I am so excited! I love to cook for my friends and family, the more the merrier!I wantto post this recipe because it is a fun twist on an old standard, sweet potatoes. Sweet potato fritters are great to have as an appetizer, for the meal, and definitely a great way to put leftovers to use after the big meal. The sweet potato fritters have a hint of sweetness and are served with a honey cinnamon butter. Umm, yes please. Mix sweet potatoes, cornflakes, brown sugar and cinnamon in a bowl. Roll mixture into 1 inch balls. Roll the formed balls into remaining crushed up cornflakes, beaten eggs and the more cornflakes. Place them on a lined baking sheet in the refrigerator. This helps them firm up a little so they will hold together in their hot oil bath. I love the little bit of crunch they have on the outside and then the smooth sweet potato on the inside. My kids love these because they are a nice bite size. Try a little something different this Thanksgiving with these sweet potato fritters. What are some of your favorite Thanksgiving foods? 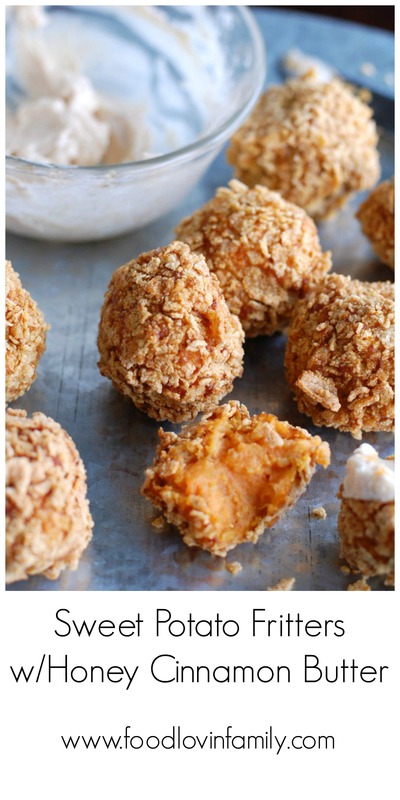 In a large bowl, mix sweet potatoes, 1 cup crushed corn flakes, brown sugar and cinnamon. Shape mixture into 1 inch balls. Put remaining 2 cups crushed corn flakes in a shallow dish. In a small bowl, beat remaining eggs. Line cookie sheet with wax paper or parchment paper. Coat potato balls in corn flakes, then dip in eggs, and then coat in crumbs again. Place balls on cookie sheet. Refrigerate for 20 minutes to firm. In a heavy 3 quart saucepan or deep fryer, heat 2 inches of vegetable oil to 375 degrees. Fry potato balls for 2 minutes until golden brown. For butter, in a small bowl, mix together butter, honey, and cinnamon.